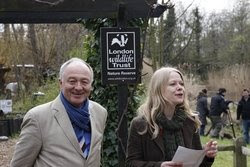 Siân Berry, the London Green Party mayoral candidate, has confirmed that she will be casting her second preference vote for Ken Livingstone on May 1st and is calling on her supporters to do the same. Ken will be casting his own second preference vote for Sian. The call unites Ken Livingstone and Siân Berry on the basis of common policies on the environment and helps unite the majority of Londoners who want to keep taking London forward. Voters can cast two votes for Mayor on 1 May - a first and a second preference. After all the first preference votes have been counted, the two candidates with the highest totals go into a final ballot. The second preference votes cast by people who supported lower placed candidates are then counted and added to the first preference totals of the two top placed candidates. Siân Berry and Ken Livingstone issued a joint statement saying: "Tackling climate change and creating a fairer London must be at the top of any serious Mayor's agenda. Boris Johnson, who supported George W. Bush in opposing the Kyoto Treaty and would scrap the CO2 charge on gas guzzlers, cannot be trusted with London's environment. Nor can a man who opposed the minimum wage be expected to promote fairness or tackle poverty. London - with a committed Mayor and Green Party representation on its Assembly - has taken a global lead on environmental and social justice over the last eight years. Let's keep it that way."